In recognition of Read Across America, I am taking March to share some of my best experiences reading aloud to students in my school. As a principal, I believe it is imperative that I get into classrooms on a daily basis and model this lifelong skill. I have been a regular visitor to my kindergarten classrooms. One strategy I have found to be effective with five and six year olds is making text-to-text connections by pairing different books. It can be the same author, a similar genre, or just pairing two books that have something in common. 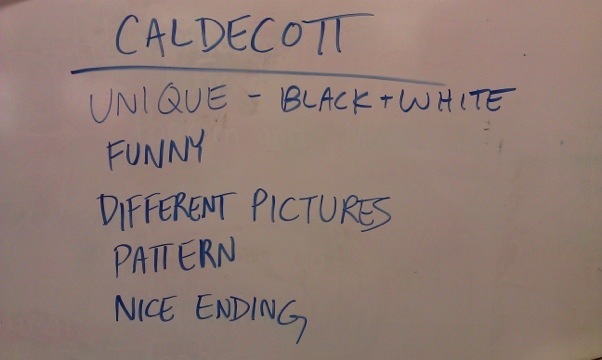 In this post, I describe how kindergarteners developed criteria for what makes a Caldecott winner so special. I show students the cover of the book I am about to read them. I ask, “What do you notice?” This type of question, suggested by reading expert Mary Lou Manske, allows all students to participate without a lot of risk because almost anyone can notice something. Right away students point out the title, the author and the cover illustrations. Once a student spots the shiny gold circle, they ask, “What is that for?” I respond by telling them that it is a symbol for an award the book won, the Caldecott medal. It won the award because it was considered the best book published that year. We compare the award to something they were recognized for, such as in sports or being on the Wall of Effort at school. With the second book, I chose to read aloud A Sick Day for Amos McGee by Phillip Stead. There is a purpose to this pick; the book also uses pencil in its illustrations in addition to being a Caldecott winner. Before reading, we review as a class the criteria we developed for the first book. Amos McGee normally visits the animals at the zoo, but cannot today because he is home sick. The animals take it upon themselves to visit Amos at his home (via bus), to take care of him in the same way he took care of them. While reading the story, students are more apt to notice the similarities between the two books. Having the criteria displayed on the whiteboard while I read aloud is a helpful visual. 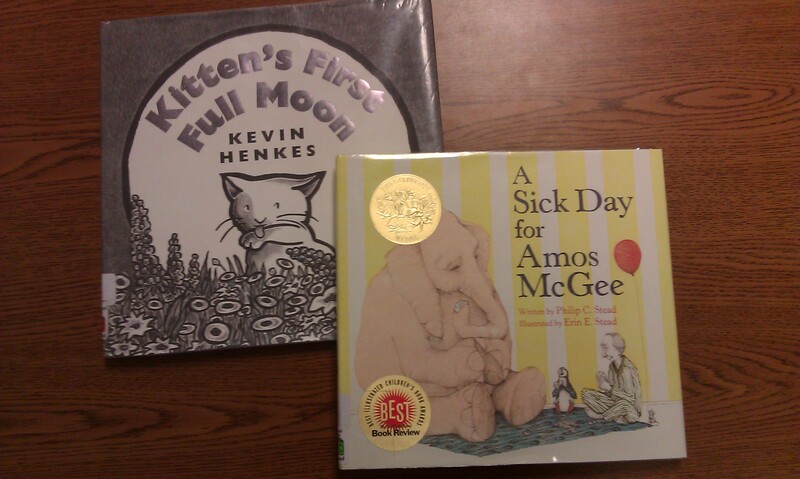 Once done, we go back through the second book to determine if A Sick Day for Amos Mcgee has some of the same qualities that we listed for Kitten’s First Full Moon. Not surprisingly, the books are very similar in many areas. For example, even though one book is black and white and the other is in color, both books are unique in that they use pencil for the illustrations. Plus, neither book has the blaring colors that so many other picture books contain. The illustrations with these two books are more subtle. Subtle – too big a word? I don’t think so. If kids can remember the Latin names of several dinosaurs, the terms “subtle” and “criteria” should be a breeze. Even if they all don’t fully understand the concepts, they have had the terms used in context and will hear them again in the future. What’s even better, their classroom now has a list of criteria to help them select books for their next visit to the school library.